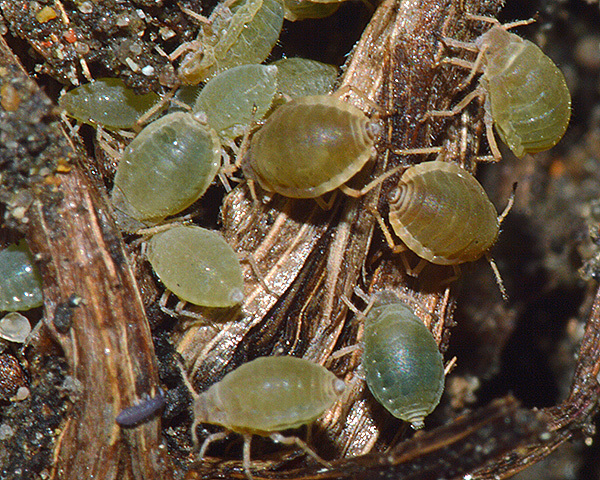 Forda are medium-sized aphids. On the primary host they live in galls. The fundatrix initially forms a small temporary gall near the apex of the leaf, but her offspring move to the leaf margin where they form characteristic leaf-edge galls by folding and rolling the leaf margins. Emigrant alates have a dark head and thorax and a pale body. Fordaapterae on the secondary host are often yellowish-white and plump-bodied and are not waxy. About 10 Forda species host alternate (in the Mediterranean region and south-west Asia) from pistacchio (Pistacia) to the roots of grasses and cereals. Outside the range of Pistacia, several species are known only from their secondary hosts. They are attended by ants on the secondary host and often live in ants' nests. Adult apterae of Forda formicaria vary in colour from off-white to dull yellow to various shades of dark green or bluish-green. The primary rhinarium on the base of antennal segment 5 is very large, transversely long and extending around the segment. It is 4-5 times larger than the primary rhinarium on antennal segment 4 (this distinguishes it from most other Forda spp. which have the primary rhinarium on the base of antennal segment 5 almost circular and less than 2.5 times larger than that on antennal segment 4). The body length of Forda formicaria is 2-3 mm. Alates migrating from the primary host have a black head and thorax and a green-yellow abdomen. In the Mediterranean region and south-west Asia, Forda formicaria forms half-moon-shaped galls on its primary host Pistacia spp. (pistachio). Alates leave the galls in September to November, and move to the roots of numerous grasses and cereals where they found colonies. In many other parts of the world (northern Europe, parts of Asia and North America), host alternation (and sexual reproduction) have been lost, and they live on the roots of grasses all year round. Forda formicaria are always attended by ants, and often live within ants' nests. 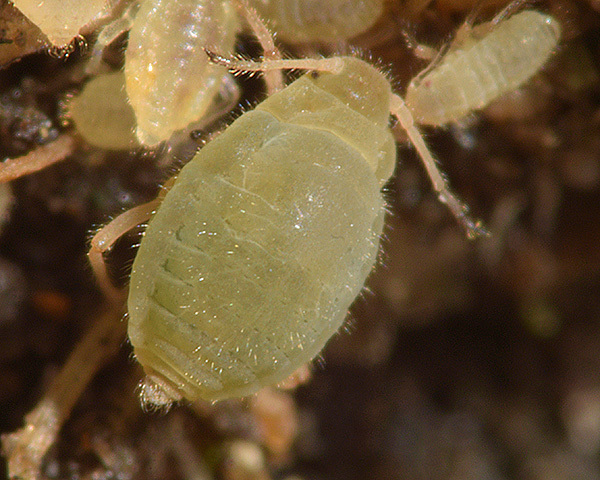 Adult apterae of Forda marginata on their secondary host (grass roots) vary in colour from green to greenish yellow to brownish yellow (see two pictures below). The body is highly domed dorsally and there are no siphunculi and no wax. Adult Forda marginata apterae have short antennae (0.5-0.64 mm) (see first picture below) which are only 0.19-0.29 times the body length (cf. Forda formicaria which has markedly longer antennae). The rhinarium on the base of the fifth antennal segment is almost circular (see second picture below) and less than 2.5 times larger than that on the fourth antennal segment (cf. Forda formicaria which has that rhinarium very large and extending around the segment). The cuticle has thorn-like sculpturing which is especially well developed on the head and thorax. 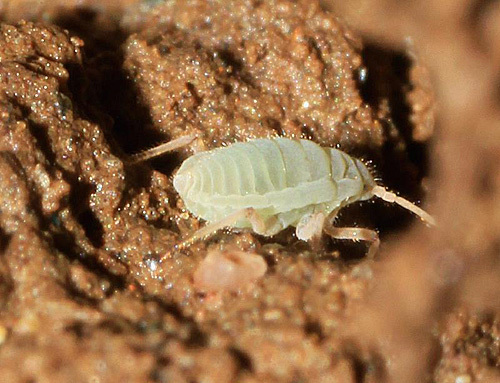 In southern Europe, the Middle East and north west India the crusty pistachio-grass root aphid host alternates from Pistacia, where they live in yellowish or green galls formed by upward rolling of the leaf margins, to grass roots (Poa, Bromus, Dactylis etc.). 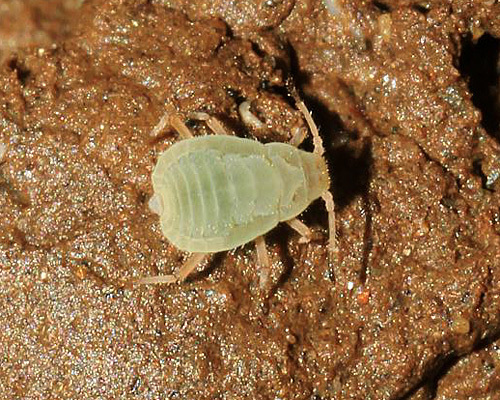 In northern Europe, North America and parts of Asia Forda marginata exist as parthenogenetically reproducing populations on grass roots year round. We especially thank David Fenwick for the images of Forda formicaria.